My own search for Tenkara brought me to Japan and a visit with other Japanese fly fishers. In their presence, Yuzo Sebata was talked about and the Japanese media reflected on his mountain ethos. 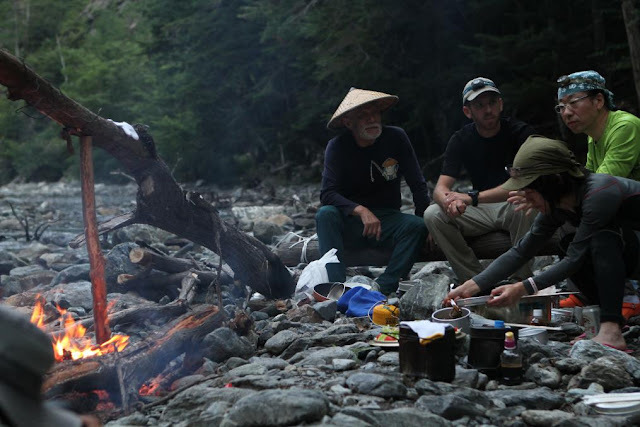 Fishing the valleys, seeing my friends live the mountain lifestyle, picking mountain plants to eat on the trail, pointing out and identifying plants and animals, I realized that there was more to fishing than what I understood of the typical American view. In the Japanese fishing lodge, relaxing after a long day of climbing steep headwater streams, it was there that I knew I wanted to know more about Yuzo Sebata. Returning home to America and reflecting on the experience, time faded the details but that was not the case of Yuzo Sebata. I had to find a way to contact Mr. Sebata and talk to him myself. I want other people in America to know more about Japanese Tenkara and how the Japanese look at mountain life. Through Keiichi Okushi’s translation of the interview, we will know more about this great mountain guide. Adam: Sebata-san, thank you so much for taking my interview. I must say that I am impressed with the stories that I have heard and read about you. Your good nature in the mountains is spreading far and wide. When I was at Re-Rise lodge (near Takayama) my guide and friends talked a little bit about you. It was then that I realized that you were more than a discovery, you are very important to Tenkara. Yuzo Sebata: It is about 50 years ago. I got to know “Nikko Tenakra Fishing”, which has been developed around Nikko region (In Tochigi prefecture), by chance. At that time, I was doing course fishing for Yamame. One day I visited Nikko region for Yamame fishing and stayed one night at local friend’s house. That night, I heard the many interesting stories from the patriarch of the village. He told me about fishing as well and said “There are so many types of fishing but the most enjoyable fishing is Tenkara, no doubt.” He also said “You never be able to quit Tenkara fishing if you catch 5 trout with Tenkara fishing”. I was completely fascinated by his so interesting stories, and soon after I tried to take up Tenkara fishing with just interest. I made furled taper lines and flies by myself remembering the ones the patriarch had shown me. Thus I made the first step to the unknown fishing. I knocked the door of Tenkara fishing with my mind that just want to try. This was the debut of my Tenkara fishing as a beginner. Adam: That is quite a long time. I quit fly-fishing with a reel and have been fishing only Tenkara for a little more than four years now. I feel that I have learned very much about it. I must tell you that I enjoy learning about where it came from and how it is practiced in Japan from interviewing Prof. Hisao Ishigaki and having private instruction from Masami Sakakibara. I want to remain true to the origins and practice. I am not interested in changing it. Yuzo Sebata: Frankly, I feel very happy from the bottom of my heart. I have been giving myself up to Tenkara fishing since I was about 20 years old. I feel as if I am standing in the front stage and my feeling is uplifting to know that simplicity and fun of Tenkara fishing has been accepted and recognized by many people regardless of Japanese or foreigners. So I am very much pleased that Tenkara fishing is getting popular in USA, which is the country of fly-fishing. I think Tenkara fishing has charm of something special that has been admitted by American people. Daniel-san told me it has been about 4 years that Tenkara fishing was exported to USA. I did Tenkara fishing with him in the Southern Alps of Japan. His Tenkara fishing was superb. I thought it was like Tenkara fishing had been re-imported. 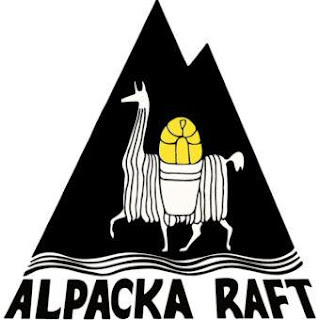 Adam: I really enjoyed Daniel Galhardo’s reporting on his trip in the mountains with you. I must say that I am left with a feeling of your connecting Tenkara with mountain life on a deeper level than I have seen anywhere. When I was in Japan, my friends and guides would often forage for mountain vegetables when walking. This action made me feel that the Japanese knew much more about their surroundings than I had understood. For me, you are what you eat, what you read, what you do, what you are interested in. I am self-taught in nearly all that I do. If I am introduced to something I enjoy, I then set about practicing it on my own, while researching and sharing my experiences with others. I live in a large Southwest American city of millions of people, Phoenix, Arizona. It is a city in the desert and there are no streams for nearly a hundred miles. In between times of fishing the forested alpine streams, I spend as much time as possible in our desert mountains; I hike at least a few hours each week. I am somehow connected with the mountains like I am connected with my mother. I struggle to explain it. Mountains make me secure, regular visits make me calm. I visit the mountain environment to keep grounded. Even in my desert mountains with no water, I still feel home, secure. I am sure it has something to do with the way I feel after exerting myself. It is also the feelings I get when I can see such a large expanse of the earth, the beauty of nature, it is everywhere and it makes sense. Yuzo Sebata: I think the connection of the mountains with me is based on longing for nature I loved since I was a kid. It is also an extension of play in the fields and rivers when I was a boy. I think my connection with the mountains started doing fishing and it has captured the heart of curious boy and grow him. Climbing, a sport done in the midst of the mountains, caught my curiosity brilliantly, and meeting with Iwana and Yamame living in the mountains gave me definitive impression. I clearly remember that I was so much impressed with the beautiful figure of Iwana and Yamame when I caught them for the first time. Let me talk about little bit Tenkara fishing. It is not so long time ago that Tenkara fishing became flourished in Japan. Certainly Tenkara fishing has a history over several hundred years, and we can not miss its history that has been nurtured by the lore and tradition, but actually the history was handed down by just handful people. When I was a beginner of Tenaka fishing, I never saw other Tenkara fishers. I think the popularity of Tenkara fishing began to come out about last 20 years, and it is a fact that Tenkara fishing was broadcast for the first time in the TV program "The Fishing" and it became the trigger of the boom. It was 23 years ago; I was appeared on the program as a representative of the Eastern Japan with Mr. Etsuji Katayama as a representative of the Western Japan. 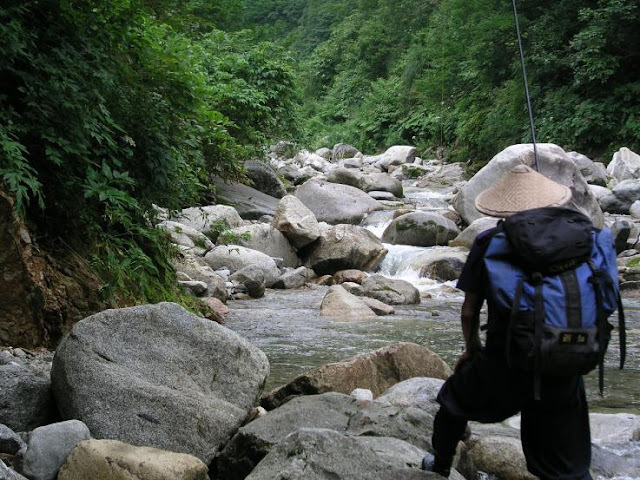 Adam: In the West, fishing is popular, but not as nearly popular as it is in Japan and in America, fishing in the mountain streams is only a small part of the whole spectrum of fishing. Bass fishing is our biggest fishing style and very little of that type of fishing is concerned with the environment that we live in. The American Fly Fishing media portrays a lot of advertising equipment, it pushes its agenda and people follow. I sometimes think that it is this advertising that creates the image of the angler. That is why I enjoy Tenkara; it promotes an introspective time in the mountain environment. To enjoy it at home, I much prefer the Internet where I can pick and choose what I am interested in and specialize my approach to fishing. The images that I see of you are quite simple yet I do see that you have a couple of specialized pieces of equipment. Yuzo Sebata: I think it is a rod. 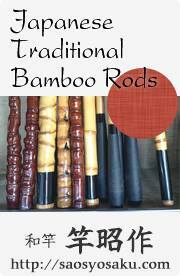 When I started Tenkara fishing, 3.3 to 3.5m length banboo rods made of Hotei bamboo were common rods. Afterwards fiberglass rods became popular with its toughness, but week point of fiberglass rod was its too heavy weight. 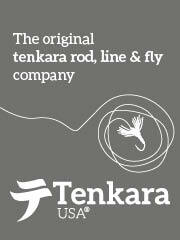 Then revolutionary carbon fiber Tenkara rods were developed and got in place for fiberglass rods. At that time I was involved in the development of new products at the request from the manufacturer and we developed 3.3, 3.6, 4.0, 4.5 and 5.0m Tenkara rods. I think those specifications of the rods have become a base of product manufacturing still now. 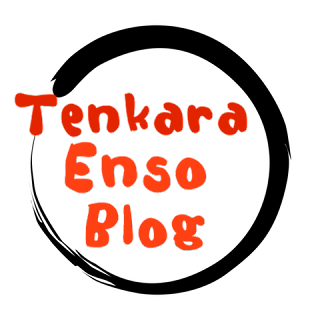 Since the summer of 2013, I have been using “Ito” made by TenkaraUSA. I like this excellent Tenkara rod because of its noteworthy advantage that we can use both level line and taper line and very convenient for both types of lines. Adam: I am grateful for my introduction of Tenkara from Daniel. I believe that he has been true to Tenkara by authenticating the experience of the Japanese, sharing it to the world, taking others along with him. In my own independent research of looking into the history of Tenkara and communicating with the Japanese, I learned much about the equipment and the history and I learned that Daniel has been true to Tenkara. I took the Ito to Japan and caught Iwana (Nikko) with it out of respect for him. Yuzo Sebata: I am using 4.5m length as a basic rod, and I choose rods with an emphasis on lightness of the rods. It is because continue of casting with heavy rods or heavy feeling rods bother good fishing taste. I think our arms get tired with casting with those rods, and it interrupts our feeling of tension and seriousness. That is the reason why I prefer lightweight rods. Adam: I realize that equipment is a personal choice. Equipment has been well refined and there are many choices. 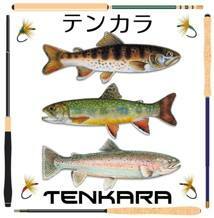 I own Tenkara rods refined by the anglers that I enjoy the most. Prof. Ishigaki and his ZE and ZL models, Sakakibara’s Oni rod, a quiver of Daniel’s rods and I have used rods by other experts in Tenkara. From my experience, the best rod companies promote the qualities that a particular Master wants in a rod. I have learned to make furled lines with a (Hiromichi) Fuji type machine. The tapered lines cast very nicely. But I enjoy the simplicity and stealthy quality of a level line. I would like to understand more of what you look for in a line and rod action. Yuzo Sebata: Concerning the Tenkara line, I normally make tapered line by myself. Sometimes I use level line for the fishing in a small stream. As for casting, I prefer some of the momentum and speedy casting. So I more like fast action rods, but sometimes I use slow action rods too. I think we tend to have little bit more unhooking fish with slow action rods, so we have to take care to do stronger hooking (Not that strong to make line break or breaking rod tip.). I often teach this point for beginners. We also must use very sharp tip hooks. I think I am self-taught type too. Besides I am very curious. As for flies or as for lines, I have invented and innovated my own unique things. Adam: As I have said, I am self-taught so I am proficient in the things that I know and smart enough to know my limitations. I will take fish once in a while to have a meal. I am somewhat limited in the knowledge of what plants to forage. The reason is that I live two hundred miles from my fishing area and nearly eight thousand feet lower in elevation. It is a long drive and again, I have no one to introduce me to which plants are safe, many can make you sick or worse if you ingest them. So I stick with my fish and I take pictures of the rest. Yuzo Sebata: Concerning sansaies (mountain plants) and kinokos (Mushrooms), I studied diligently from local people or books during my fishing trips. I have become familiar with those sansaies and kinokos remembering them one by one and taking many years. This knowledge about sansaies and kinokos has been very useful for my mountain life when I am on a fishing trip in the head of the streams. These sansaies and kinokos have become very important foods, which I cannot miss for my mountain life. Sansaies and Kinokos are natural foods that are so simple but very tasteful foods. Actually those wild foods are the unusual and very valuable foods, if we order them at luxury Japanese restaurants in the cities. It is the excellent foods we can only get in the mountains. So we have great advantage to get and taste those sansaies and kinokos. 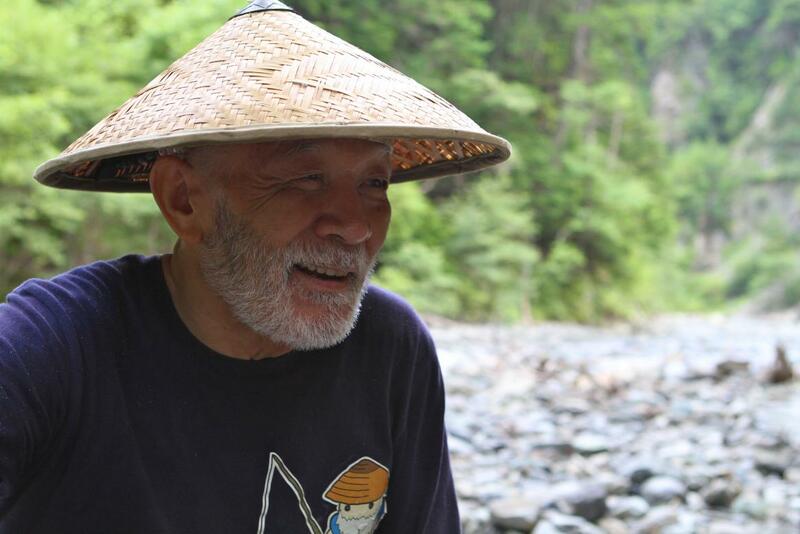 Yuzo Sebata: By the way, I never take gas or fuel stoves to the mountains with me. I even do not have that equipment. I only use bonfire on my solo trips. 100%. Adam: Shioyaki is a tasty meal. I take trout now and then and it is so good. It makes me feel good about being a fisherman. I understand in Japan, in the past, anglers killed all their catch for food for themselves and others. Now fishing is more sport and more are practicing catch and release, it is really starting to take hold. Yuzo Sebata: I think the spirit of catch and release especially in the very small area like head streams is must do thing and the most basic idea we have to keep up. For instance, if a very skilled fisherman go to river-A and do fish and bag for 10 days, trout in river-A will be visibly decreased. I really hope more and more fishers practice catch and release not to have the unreasonable thing like above mentioned. We must do fishing with love. On the other hand, catch and eat is not illegal at all. I think the important thing is not moral but to have moralist fisher spirit. I hope Genryu (Head stream) fishers have this spirit and idea. I have no doubt there is no real fishers who do not love Iwana or Yamame. In fact it is very hard to kill Iwana and Yamame for fishers. No one taught, but it becomes such a state of mind naturally. This is what has been practiced even clumsy me. We must keep minimum number of fish to eat in the mountains. This mind enriches our spirit and makes anglers to greater humans. Adam: Let's talk about mountains. In my area of the desert Southwest, there are no streams nearby my home but I am still drawn to the mountain environment. I hike foothills and mountains at least two to three times a week. While hiking, I am exerting myself, thinking about things in my life and relaxing, movement without thinking at the same time. My thoughts are brought to nature and it relaxes me. The sky, the plants, the make up of the rock and the shape of the mountains all make sense to me there. It is as if the mountain world is a part of my genetics, I am supposed to be there. The mountain environment is one of the few reasons why I feel alive. Yuzo Sebata: Fishing has been my most favorite hobby since I was a kid, but it was just after taking up Keiryu (Mountain stream) fishing, I noticed and got interested in wildflowers or alpine plants by the trail. May be I got interested in sansaies and kinokos in the same way. I think I got interested in many things in this way. So this might be because of my DNA wanted. Anyway I have contact with all things related to mountain in the same way. Then, even small things, but new discoveries are born from one minute to the next, it lead me to mountains more and more. I was just like a prisoner of mountains. I thought mountains answered to me. It was trees in the forests and it was nature and environment itself. Mountains were like a treasure box for me. At that time I was in love with the nature, loved and loved. I was just crazy about the nature. Adam: I understand that you teach and guide people, showing them how to live in the mountains. I think this is a wonderful, to share mountain skills, to share what you know with others. Yuzo Sebata: Actually I had no one like teacher who taught me the knowledge I have. If I'm forced to say, local people and my father were the teachers for sansaies and kinokos. Other things, for instance Tenkara fishing or camp life in the mountains, I have practiced and completed it with my own thoughts and sensibility. We have a proverb “Necessity is the mother of invention.” (I guess you have same saying in English.) Anyway that was it. I grew up in country, so my teacher was “mountains”. The nature around me was a teacher and what I was affected was the nature itself. Adam: As a child, my Grandparents had a cabin in the mountains where we would escape the summer heat. I was allowed to explore by myself. I would go hiking and I remember many memories from my young childhood of sitting and looking out from near the top of that tall mountain, looking out and dreaming of flying away. I have seen some mountain huts in the Japanese media. I enjoy reading the interesting things that people do online. The Internet allows me to travel through the interests of others. Yuzo Sebata: I do not have a mountain hut, but friends of mine (I think 8 people) have mountain huts or mountain house. One of friends has a 250 years old house. It is a building that has been designated an important cultural property. Some others have built log houses and use it as second houses. They have many types of mountain huts. I do not stay at mountain huts on fishing trips, except for the case unforeseen circumstances such as a sudden change of weather. I sometimes stay at some of mountain huts for sansaies or kinokos picking. Especially I enjoy staying at “Matagi Goya” a very simple and small hut hunters’ use for hunting. Normally they build it in the really deep in the mountains. Those huts are located in very convenient places in the mountains for me and atmosphere of huts are very nice and it is comfortable. I stay in the mountains for 3 days in average when I go with friends. If I am alone, I act very freely staying in the mountains as long as I have foods. When I go fishing in the mountains with friends, I make itinerary depending on convenience of friends. When I was alone and had enough time, long stay was about 10 days. The longest stay was 14 days at one place. I normally use 75L backpack with complete equipment in it. I try to pack all the staffs around 10kg in average for 3 or 4 days trip. Adam: I overnight on the stream a couple of times each season. I am not very good at it, I usually take too much stuff and not the right things but I have fun learning. I use a small tent, a little Japanese gas canister jet stove, lightweight pots and cooking utensils. I try to use clothing that serves double purposes. My sleeping bag is down (duck feather filling) and I use an air mattress. When I overnight, I try to do it at the end of a long hard day of hiking and fishing so that I am tired and end up just going to sleep instead of having an idle mind but I end up looking at my iPhone wondering what that sound is outside of my tent. Yuzo Sebata: I use a blue sheet 5.3m x 4.5m weight 1.3km. I make a shelter like thing with blue sheet using poles of trees. I think bonfire is very important basic thing for camping. After making the blue sheet shelter, I pick up the firewood and stock them in 3 levels (tinder woods, middle woods, big woods). I always keep tinder woods in the shelter not to get wet. Tinder woods must be cut straight and evenly. I really think bonfire is essential for mountain life. “To think the reason” is true in all things. I am confident this thought also matches to mountain life and Tenkara fishing. I am the person who goes to bed early, get up early in the morning. It is same in the mountain, and it is same if I am alone or in a group. I wake up in the very early morning when it is still dark. I build a fire and wait for the light watching the fire. In the evening I enjoy cooking dinner sitting by the fire. I often make “Iwana Sashimi” or “Iwana Shioyaki”. I also enjoy cooking using ingredients of the grace of mountain such as sansaies or kinokos depending on the season. Those foods are so nice with “Sake.” I spend the luxury downright time after dinner. I enjoy gazing on the sceneries of mountain and valley changed time to time. I love watching the stars in the sky at night. I indulge in thought. I do kind of mediation. I put myself in this world of nothingness. Adam: I have a lot to learn but that is what is enjoyable, the journey in making the experience. I really appreciate your participation in this interview. Tenkara in America and around the world is really taking off. I am proud to have had this opportunity to share a few thoughts with you and to allow others to realize Japanese Tenkara and mountain life. Please feel free to finish this Interview with anything that you would like to say. Thank you very much Yuzo Sebata! 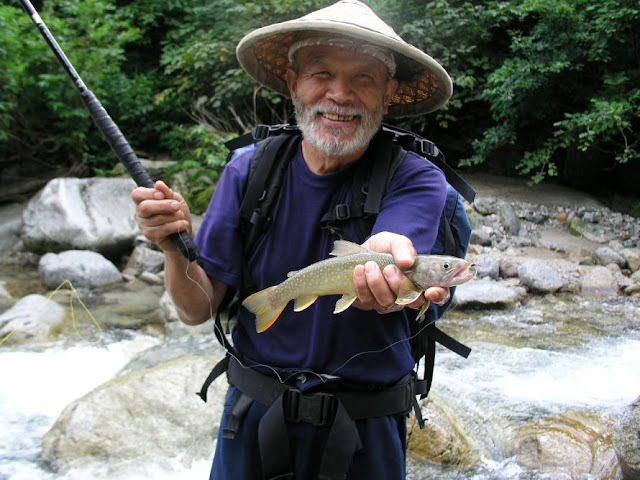 Yuzo Sebata: I have been travelling with “Tenkara” all around Japan, what’s more to big and small rivers in northwest USA. I was hanging around the steepened inhospitable valleys seeking for trout with Tenkara. Everywhere I saw and heard was common. For us, Mountains were the subjects of faith. We were taught that God dwells even in a tree. I heard that grace of mountain is a gift from mountain god. I respect nature. I respect forests and mountains as objects of faith. I think this makes the harmony with people and nature, may be a fusion. I understand this spirit become the cornerstone of human formation. In other words we are in the place of interaction with full of nature. I think if more fishers, more people point their eyes to the nature beside us, our mind will become rich, and we could enjoy fishing more.